Fictorum Preview - There Are Some Who Call Me... Tim? Editor's Note: This article should not be taken as endorsement of this, or any Kickstarter project. Crowdfunding comes with risks, and we encourage readers to inform themselves through various sources while deciding on projects to back. While I always maintain a healthy skepticism when it comes to crowdfunding in general, it can't be denied that a huge number of innovative ideas come from the platform, and these usually warrant talking about. 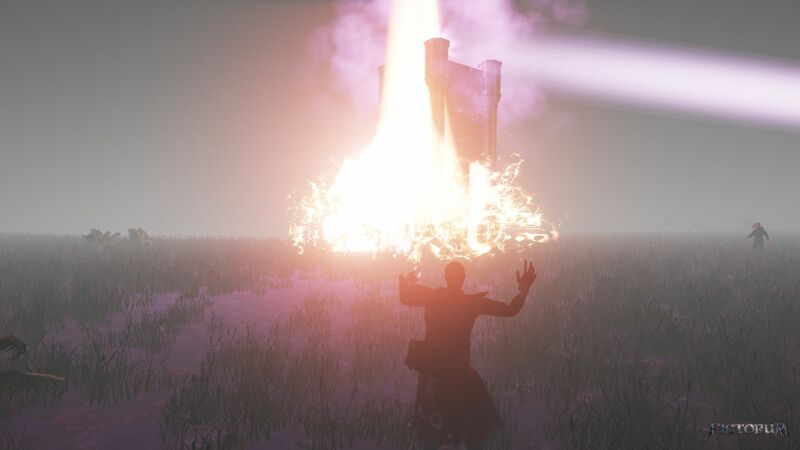 I'll also admit to having a constant fascination with playing spellcasters, as well as lingering destructive tendencies, which basically makes me the focused target of the game concept.Fictorum isn't so much a game at present, so much as a proof of concept. Having played a bit now, I can say the concept works. 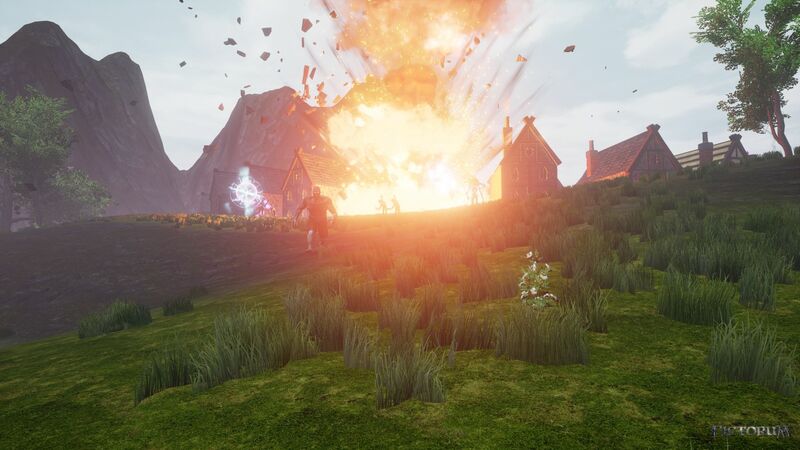 As a wizard, you'll wield powerful elemental magics in a world terrified of your order of spellcasters, and a large, closed environment filled with wholly destructible structures. 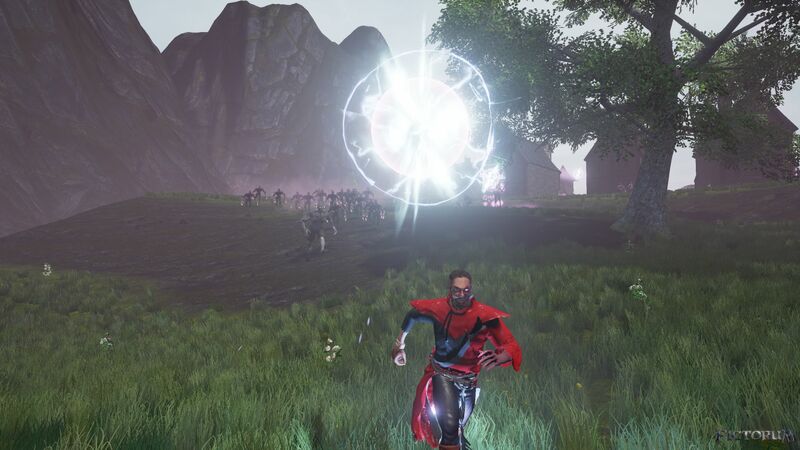 While Fictorum might not be quite into the territory of calling itself a fleshed-out game, it has a strong skeletal foundation in place already, with the core systems mostly demo-ready. Your top-level map lets you choose a path through a web of nodes, with each offering a small snippet of adventure. It's almost akin to the Super Mario Bros 3 system, in that each node can be an encounter, either positive or negative. Of course this is a First-Person Caster game and the levels are still far too rudimentary to even really be called levels, consisting primarily of short walks into open areas full of enemies to nuke and buildings to destroy. It's not quite a game, but it's way more fun than it deserves to be. I got to check out some basic Fire, Ice, and Storm spells, of which Fire was a hands-down winner for entertainment value. The spellcasting system is such that while you're aiming a fireball to cast, you can right-click and drag around a pyramid of runes to modify the spell. I was particularly fond of the multi-shot rune, which, as you might expect, shot multiple fireballs with each attack. Double that up with the High Explosive modification, and you've got a great siege weapon to take down those settlement walls. As little as there is to the gameplay at present, there's no shortage of things to do, assuming you enjoy razing entire villages and mercilessly slaughtering the generic pseudo-people that inhabit the world in this early stage. There's a decent bit of story in the game already, but it'll need to be fleshed out a lot more to make a fulfilling narrative experience. Though if they get the mechanics right for destructible buildings, I doubt many of us will care that much about the narrative. An example of the end-of-game summary of your character's journey is just below, if you'd like to check out one of my runs. As a reminder, we do not endorse backing Kickstarter projects. Even funded projects have risks. 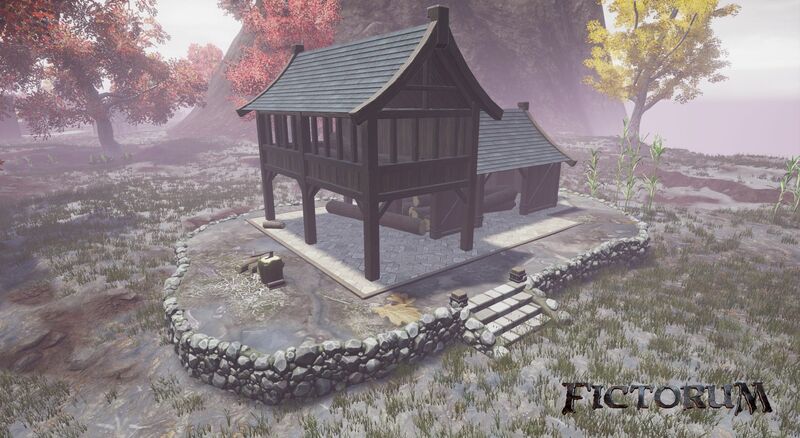 Fictorum is close to its funding goal with only a few days left, so might be worth looking at! 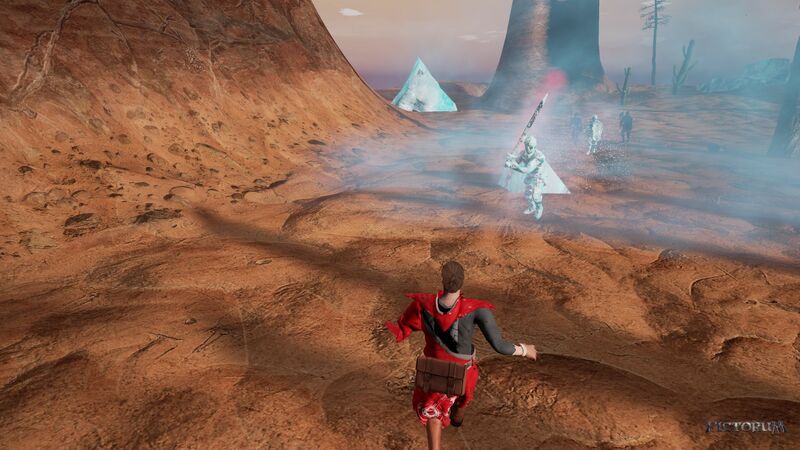 It was said that the Fictorum once passed through the vast, sweltering mesa that housed a small town called Baro. The area was annexed not long after the cataclysm, but was on the outskirts of Inquisition control and never received enough resources. encaen was a destructive force through the area. The devastation on this mountain can still be seen to this day. 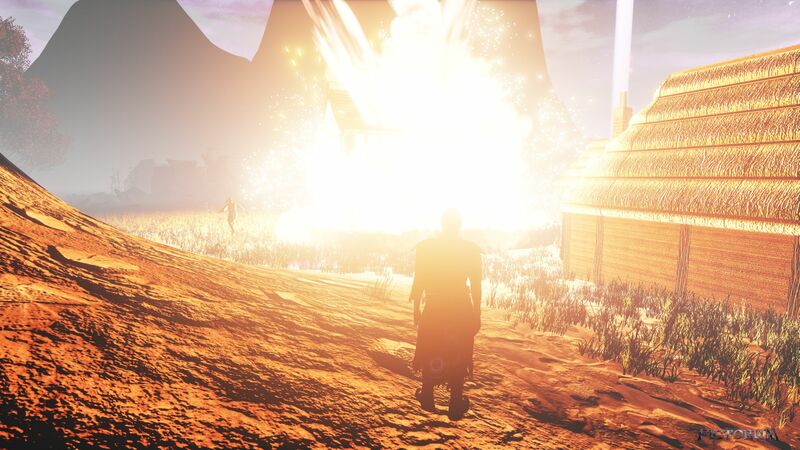 After the encounter, the Fictorum quickly examined his findings from the area and recollected himself before heading off to his next destination. Rolling hills greeted encaen while following the long road to the nexus. Along the way, he happened upon a slim, mustachioed man staring at a wagon with a shattered wheel, shaking his head. He noticed the Fictorum looking behind him and jumped, quickly realizing who it was. Smoothly regaining his composure, he smiled widely, and donned his, assumedly standard, salesman air. "It would appear that I might be here for a while. Any chance that I can interest you in some of my wares to help lighten my wagon's load?" encaen arrived at the small trading town of Permut as the sun set. The citizens and merchants were in the process of closing up for the night while guards made their last rounds for the evening. The arrival of the Fictorum went unnoticed, and the Aegis was still left disabled from the day's trading. The Fictorum was left with a choice. encaen suffered grevious wounds that day. 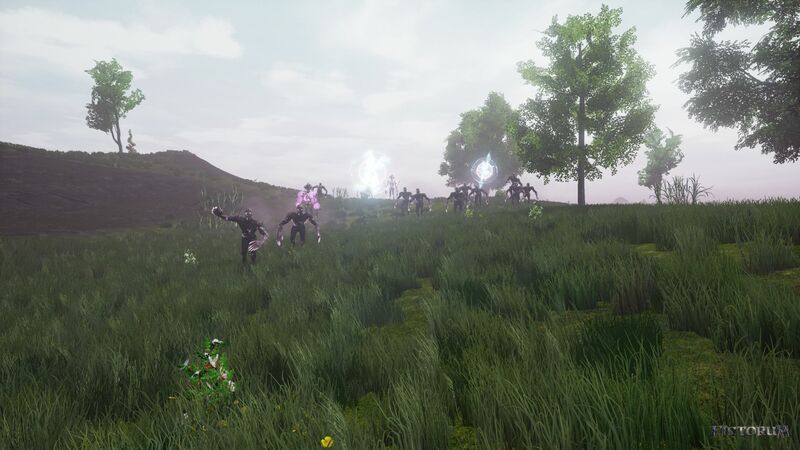 encaen quickly gained his bearings and scanned the new location: a plateau with dense forestation. A middle-aged man in dirty clothing with a sunburned, bald scalp immediately stumbled into the clearing, out of breath. He quickly grabbed the hilt of a polished short sword, looked the wizard up and down, gauging him. Upon realizing what he was, the man stammered "S-sir! Fictorum! I beg you, please help me!" encaen took more hits than a normal man would have been able to withstand. 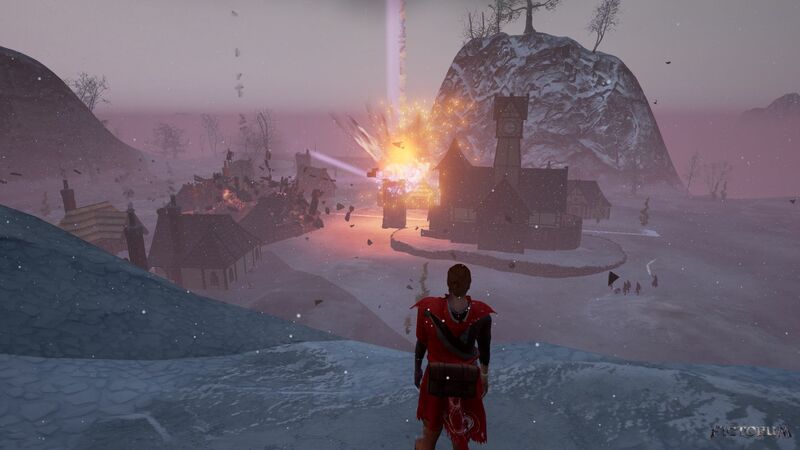 It was a cold night that the Fictorum arrived at a small villiage. The lights at the Dancing Bear tavern were bright and the patrons were loud and rowdy. Surely, none of them knew that some of those among them were, in fact, murderers, but they every patron would remember the night that encaen came for vengeance. The inquisition completed their mission, all praise be to the Lord Inquisitor. encaen's execution was completed here.